Only a good checks company can assure you of all the aspects that you need to take into consideration when you are getting manual business checks for your company. Different types of information are required in order to create the right kind of custom business check for your company. However, once this information is stored with the professional checks company that we are, repeat orders are extremely easy to place. Check companies are realizing today that there are specific security measures that also need to be taken in order to prevent fraud. This is something Printez.com has been aware of for many years. It is important that the interest of the customers be protected. This is why there specific measures that we take in order to ensure that no fraud can be perpetrated with regards to these checks. 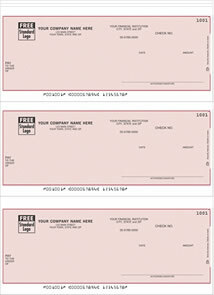 The simplest of these is the logo that is printed on the manual business checks. In addition to that a hologram or heat resistant ink can also be used to add to the security. Some check companies also use chemically sensitive paper or invisible fluorescent fibers too. 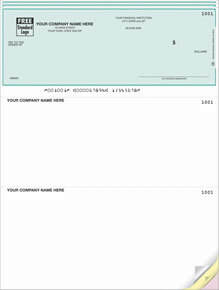 Not only can you get away from the boring and staid checks that banks offer you, you can ensure that your company gets to advertise with the custom business check that you create. 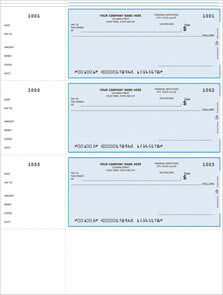 In addition to that the ones available at Printez.com are available in formats that include one-write checks, 3 to a page checks, easy to tear and most apt for record keeping. In fact you can find complete starter kits that include check binders, company stamp, tamper evident tape enclosures and more. The best part is that once you place an order, ordering manual business checks the next time becomes extremely easy and quick.